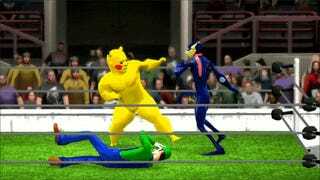 Pikachu, all the Nintendo characters and Smash Bros. itself would look different in the context of a pro wrestling game. Very different. It's hard to tell who changed the most in madagascarsan's WWE mashup, but they're all convincing.